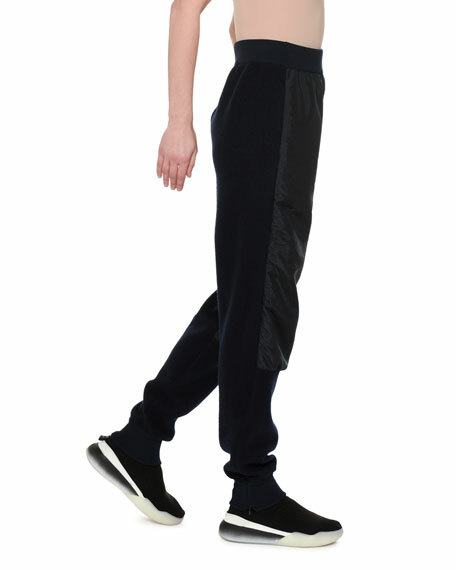 Stella McCartney jogger pants virgin wool knit with parachute-tech front. 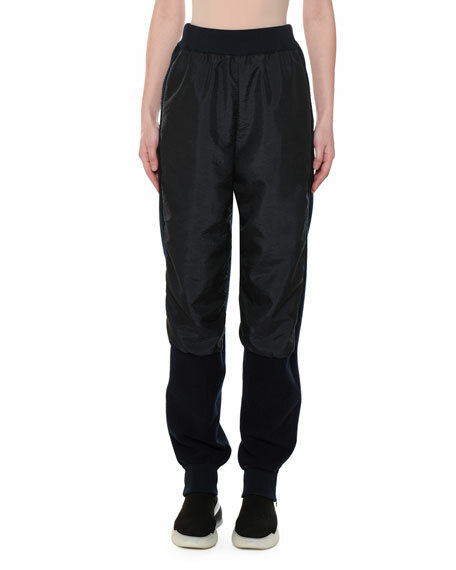 3.1 Philip Lim check jogger pants. Mid-rise; belt loops. Concealed fly. Side slip pockets; back button-besom pockets. Side-leg stripe. Relaxed fit. Tapered legs. Side slit hem. Wool/cotton/spandex. Imported. Model's measurements: Height 5'10"/177cm, bust 33"/84cm, waist 25.6"/65.2cm, hips 35.8"/91cm, dress size US 2-4/FR 34-36. ATM Anthony Thomas Melillo camo-print jogger sweatpants. Fitted through tapered legs. Side slip pockets. Banded cuffs. Ankle length. Pull-on style. ATM Anthony Thomas Melillo camo-print jogger sweatpants. Fitted through tapered legs. Side slip pockets. Banded cuffs. Ankle length. Pull-on style. Cotton. Dry clean. Imported. Model's measurements: Height 5'10"/177cm, bust 31"/79cm, waist 24"/61cm, hips 34"/86cm, dress size US 0/2. Blanc Noir "Posh" velour jogger pants. 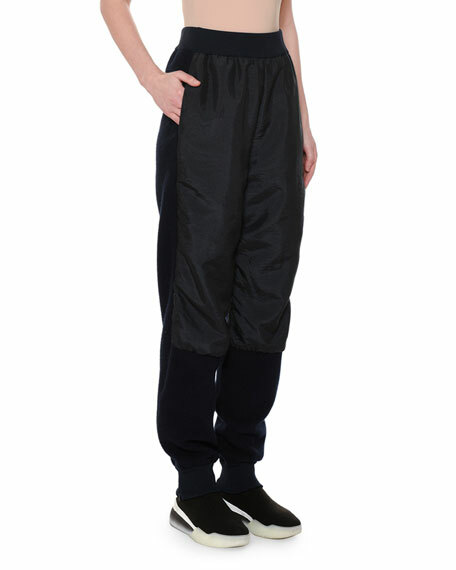 Elasticized drawstring waistband. Side slip pockets. Straight-leg fit. Banded cuffs. Ankle length. Pull-on style. 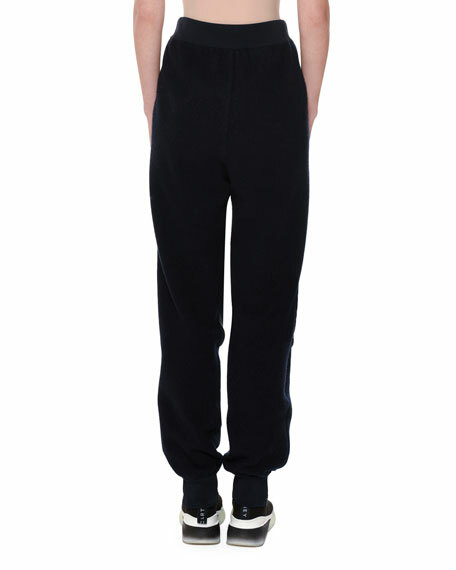 Blanc Noir "Posh" velour jogger pants. Elasticized drawstring waistband. Side slip pockets. Straight-leg fit. Banded cuffs. Ankle length. Pull-on style. Polyester/spandex. Contrast, silk/spandex. Imported. Model's measurements: Height 5'9" / 175cm, bust 32" / 81cm, waist 23" / 58cm, hips 34.5" / 88cm, dress size US 0/2. Brunello Cucinelli jogger pants in metallic leather. Approx. measurements: 8.5" rise; 23.5" inseam; 33.5" outseam. Drawstring waist. Side patch pockets. Brunello Cucinelli jogger pants in metallic leather. Approx. measurements: 8.5" rise; 23.5" inseam; 33.5" outseam. Drawstring waist. Side patch pockets. Relaxed fit through tapered legs. Ankle-length. Lining, acetate/polyester. Made in Italy. Model's measurements: Height 5'11"/180cm, bust 34"/86cm, waist 24"/61cm, hips 34"/86cm, dress size US 4.